A wet winter is bringing a bumper crop of cheatgrass, and it won’t take many warm, sunny days for it to dry out and join the fuels already stacked up waiting for a spark. So far, 2017 has been the fourth wettest on record, with 15.57 inches of precipitation falling since Jan. 1, according to National Weather Service files dating to 1906. But the last rain to be recorded in Minden was on May 7. After a wet year, a lightning strike in May would be unlikely to set off a wildfire, but firefighters say last year’s crop of cheatgrass is dry enough to serve as tinder. The wet winter also left lots of pooled water in the area around the Minden-Tahoe airport, Taylor said. “There’s pooled water everywhere, and that can attract an increase in lightning strikes,” he said. That area’s sandy soils typically allow water to soak in quickly. The same could be said for the Carson Range of the Sierra, which hasn’t seen a big fire in Douglas County since 1996. Carlini said while a lot of the Pine Nuts’ upper slopes have been reduced to cheatgrass, there’s a lot of unburned area in the mid-slope areas. Carlini said defensible space is critical to helping firefighters protect homes in a big fire. Goss said the best way to avoid a big fire isn’t to let one start in the first place. For information on how to prepare for wildfires, visit http://www.livingwithfire.com. Douglas County’s biggest wildland fire in 2016 claimed a home and other structures after a wall of flames driven by high winds crossed a field of dry grass and jumped the East Fork of the Carson River. 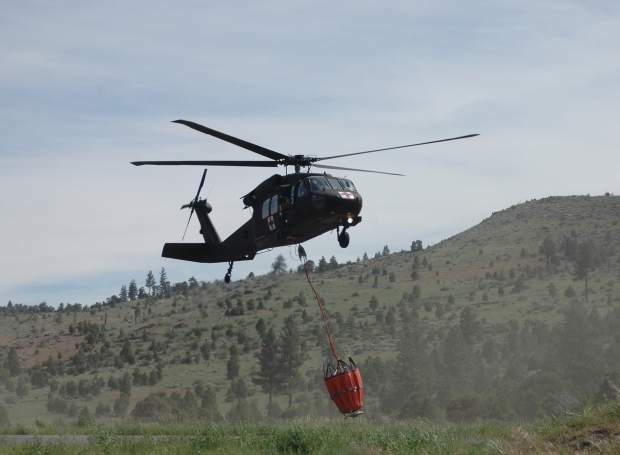 Carlini said if not for the help of surrounding agencies, most single Western Nevada departments’ firefighters could easily be overwhelmed in a large fire. Carlini said while he expects full response to fires occurring in the Sierra Front, sending firefighters to blazes farther away will be a challenge this season. “Some of the responses for out of state and regionally, overall, could see some metering back,” Carlini said. He said several of the districts’ managers have earned certification to serve on National Type II fire teams.